There were a lot of great games released on the PlayStation 3 throughout its lifetime and some of them haven’t been very well appreciated despite how enjoyable they actually are. Here is a list of just a few of those games in the hope that some of you will take a peek beyond the popular AAA releases and discover a few games that might just capture your hearts. This is an open-world fantasy RPG released back in February 2012, just a few short months after that other open-world fantasy RPG everybody was looking forward to, The Elder Scrolls V: Skyrim. As you would expect, not many even knew about the game, let alone purchased and played it but those who did got to experience a beautiful world filled with lots of elves, spiders and magic. I will say that Skyrim is a better product overall but there are certain elements of Kingdoms of Amalur: Reckoning that I prefer. The weapons and armour designs in this game are much better, in my opinion. You won’t have to play it for upwards of 20 hours before you’re able to access armour sets that make you look like a total badass. The world itself is also well designed. The developers, 38 Studios and Big Huge Games, didn’t shy away from using vibrant colours throughout Amalur, which makes it a joy to explore. Other than the above average design work, the game’s battle system is also appropriately fast and flashy which I thought was perfect for this game. It truly is an underrated gem, ignored by many but it is worth your time. This is a game I’ve just recently discovered. Stuntman Ignition was developed by Paradigm Entertainment and published by THQ. It’s a game where you play as a stuntman and try to pull off flashy stunts and daring maneuvers in a car in order to make the director happy. Naturally, the game features a lot of crashing, explosions, motor vehicles, more explosions, stunts and just a few more explosions. If you’re a fan of the Burnout series, you might find this to be quite the treat. The game doesn’t take itself too seriously and even parodies a few well known action movies including the James Bond film, Die Another Day. Initial reviews for the game were just slightly above average but it’s a fun concept and it was brought to life very well, in my opinion. Here’s a game many have probably heard about but haven’t played for one reason or another. Enslaved: Odyssey to The West is an action-adventure game developed by Ninja Theory released in October of 2010. It released back when me and all my friends were still deep in our first person shooter phase and all we could think about was the upcoming release of Call Of Duty: Black Ops. As the name implies, the game is based on the novel “Journey to the West” by Wu Cheng’en. However, instead of being set in ancient China, Enslaved is set in a post-apocalyptic world 150 years in the future. Enslaved was very well received and was praised for its beautiful art style as well as impressive visuals, facial animation and voice acting. It’s a unique game, to say the least. Definitely worth a try. Folklore is an action role-playing game developed by Game Republic and published by Sony Computer Entertainment that came out in 2007. While many haven’t played it, it is regarded by those who have as a true hidden gem on the PlayStation 3. The game is based on Irish mythology and is centered on two playable characters, Ellen and Keats, who attempt to uncover the secrets and mysteries of the small sea-side village of Doolin. Folklore received high review scores but overall sales were lower than expected. There were plans for a sequel but due to the poor sales, Sony decided against it. It might have just been a marketing oversight or a less than ideal release window which led to the underwhelming sales figures. Either way, it’s a decade old now but you should still give this game a go. Here’s an oddball title. Puppeteer was developed by SCE Japan Studio and released for the PlayStation 3 back in 2013. The game is playable in either 2D or 3D and was one of the few games that actually played well in 3D at the time. At its core, Puppeteer is a platforming game but the way the game is presented to the player is quite unique. It’s as if the player is sitting among the audience watching a play. The player’s frame of view doesn’t move much but the entire set-up of the stage changes as the game progresses in accordance with its story. Couple that with the uniquely quirky art style and you’ve got yourself a pretty interesting product. If you’re a fan of platformers then do yourself a favour and try out Puppeteer. I haven’t mentioned any games that involve shooting things yet, have I? Not to worry, here’s a good one. Developed by Platinum Games, the people who gave us Metal Gear Rising: Revengeance, and published by Sega, Vanquish is a sleek, fast, third-person action game which involves a healthy amount of shooting. Platinum Games is very well known in the industry as being one of, if not THE best at making action games. The character’s movements are fluid, fast and stylish. Gun shots are snappy and impactful. Overall, the game is a fun experience above all else. It’s really no wonder why Vanquish has a strong cult following. This is a slightly weird game developed by Atlus, the same people who gave us the Persona series. Catherine has been best described as an “unconventional romantic horror” game whereby the player takes control of a man named Vincent Brooks who is in the middle of a dilemma of choosing either his girlfriend, Katherine or a young girl he just recently met, Catherine. During the day, Vincent goes around doing what most normal people would normally do while trying to manage his two relationships, however, at night, he experiences vivid nightmares in which the real gameplay lies. It really is quite hard to properly explain this game so I invite you to try it for yourself. If you’re a fan of puzzle platformers, it might even sneak it’s way into your list of favourites. Ever since the Souls series became popular, more and more people have grown to enjoy difficult games. Well, Resonance of Fate is one such game, only instead of being a dark demon-infested action RPG, it’s a flashy, quirky strategy JRPG. Resonance of Fate was developed by tri-Ace and published by Sega. The game’s Director, Takayuki Suguro had previously worked on Final Fantasy Tactics and Vagrant Story. The game is set in a futuristic steampunk environment and unlike most JRPGs, Resonance of Fate’s combat is centered on guns. However, don’t go in expecting a regular third-person shooter with some RPG mechanics thrown in. It’s far more complicated than that. It might take a few hours to get to grips with the game’s battle system and even then it’s very likely that you’ll be dying quite often but if you are seeker of challenge and woe, unlike myself, then this is for you. This is an action adventure game developed and published by Ignition Entertainment. The game’s development was led by Takeyasu Sawaki, who has previously worked on games such as Devil May Cry, Okami and Steel Battalion. This game was released back in 2011 and was very well received by players and critics, however, it isn’t a title remembered by many due to the slew of other incredible releases that year. The game’s story is based on the Book of Enoch, albeit with a lot of fantastical elements thrown in, and puts players in the shoes of none other than Enoch himself. It’s a game worth trying even just to experience the visuals and combat system if nothing else. Ever wondered what a game based on dreams the Polish pianist and composer Frédéric Chopin might have had hours before he died of Tuberculosis would be like? No? Well, you won’t have to. Eternal Sonata is a JRPG developed by tri-Crescendo and published by Bandai Namco and it’s based on just that. It even features some of Copin’s compositions played by pianist Stanislav Bunin. Although this game was very highly anticipated, even becoming the fourth most pre-ordered game on Amazon Japan at the time, its impact in the West wasn’t quite as substantial. Even today, Eternal Sonata is unknown to most gamers who aren’t avid JRPG players. Eternal Sonata is a game that deserves to be played and appreciated. I invite you to at least give this game a try, especially if you’re a fan of JRPGs. So, that’s it. Just a few games that I believe more people should experience. I truly hope at least one of them caught your eye. 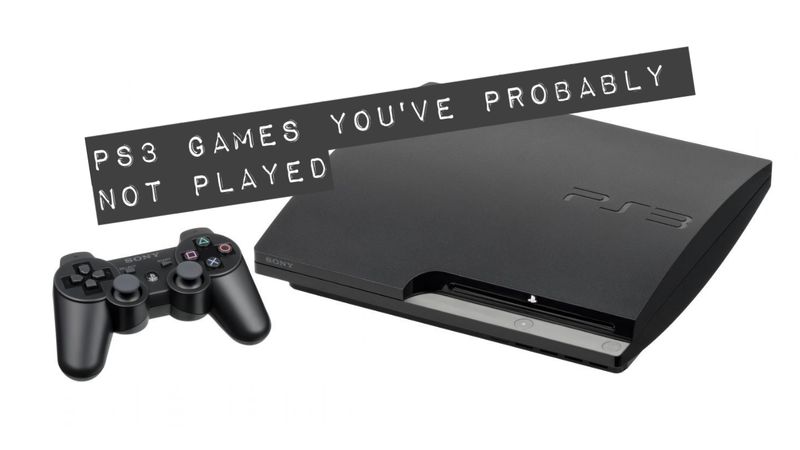 Let us know what some of your forgotten PS3 gems are in the comments below! A passionate lover of games who likes what he likes and is vocal about what he doesn't. Also enjoys long walks on the Phon Coast.